All coffee has good stuff, like antioxidants and caffeine. But coffee can also have high levels of mold toxins that rob you of your natural energy and mental agility, day after day after day. This coffee is farmed, screened and tested to be free of 27 toxins according to the strict Bulletproof Process, leaving you free to be your awesome self, every day. Fast & Convenient - The Original Coffee Pods are what's needed to get a fast and effective jump-start to the day. Make a quick cup of coffee using a single-serving coffee brewing machine compatible with the Keurig K-Cup brewing system. Coffee pods are perfect to use in office break rooms and hotels, or while traveling. You can also use the coffee in these pods with any cup of hot water to make quick coffee when you're in a time crunch. 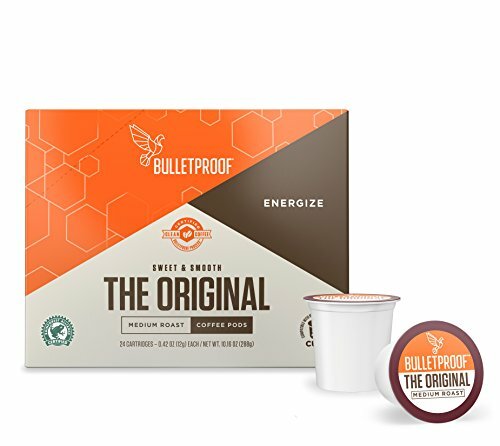 Extra Strength Bulletproof Processed Coffee - Each coffee pod is tightly sealed with 12 grams of pre-ground Bulletproof The Original Coffee Beans. These beans were obsessively selected, tested, and exotically processed to be as free of performance-robbing coffee toxins as humanly possible. You'll feel the difference in your very first cup.